As a specialty retailer with large stores, Total Wine & More provides consumers of beer, wine and spirits* a shopping experience that is unique from grocery, wholesale club, and convenience stores. This has been our owners’ goal since they started in the beverage industry in the 1980s operating a large beer store. With beer retailing beginnings and their 1991 launch of Total Wine Ɨ, we can truly say that we’ve been selling craft beer since before craft beer was even called craft beer. Beers from today’s elder statesmen craft brands that started during the ‘80s, such as Sierra Nevada and Samuel Adams, were sold from our shelves when they were upstart operations. Wow, were these brands unique from the beer mainstream back then! And today’s hot craft brands that launched during the ‘90s, such as Dogfish Head, have been on our shelves since day-1 of their bottle distribution. Craft beer has been in our stores through all of the category’s ups and downs, and as we’ve grown we’ve brought our ever-expanding craft beer aisles with us to each store and state. We’ve learned a lot about beer over the decades, along the way making craft beer accessible to a wide spectrum of consumers; from novice beginners to geeky enthusiasts. We’ve learned a lot from customers, including not only their desire for us to provide great prices on the largest beer selection we can muster, but also to introduce beer displays that help make exploring, discovering and learning about the vast world of beer a more approachable proposition. Our expansive store set of 4-/6-pack and single beers in of itself makes for a different beer shopping experience than most anywhere else, offering customers different ways to shop beer. We carry a LOT of products, for sure, and there’s no one specific way to merchandise wine, beer or spirits that will please ALL consumers. It’s not possible to do it the way everyone thinks about these categories. Yet, there are display approaches which can result in a more fruitful, and even educational, shopping experience for a greater majority of customers. Our sales of single bottles increased across the three test stores, ranging from 15% to 29% consistently through the year-long test. (That’s huge). Customers were buying MORE single beers than with the old alpha-by-brand set. They were not only buying deeper (taking home MORE of some of the already-popular beers), but they were also buying wider (selecting MORE individual beers, some of which hadn’t seen this level of movement). This meant our customers were more engaged with the bottle offerings; they were discovering more beers that they apparently weren’t seeing or perhaps were ignoring with the old alpha-by-brand set. The style group set opened their eyes to new and more bottle offerings; and some customers were experimenting more by trying some of those previously undiscovered, new-to-them brands. BEER SINGLES = EXPERIMENTATION. Beer packs = grab your favorite(s). 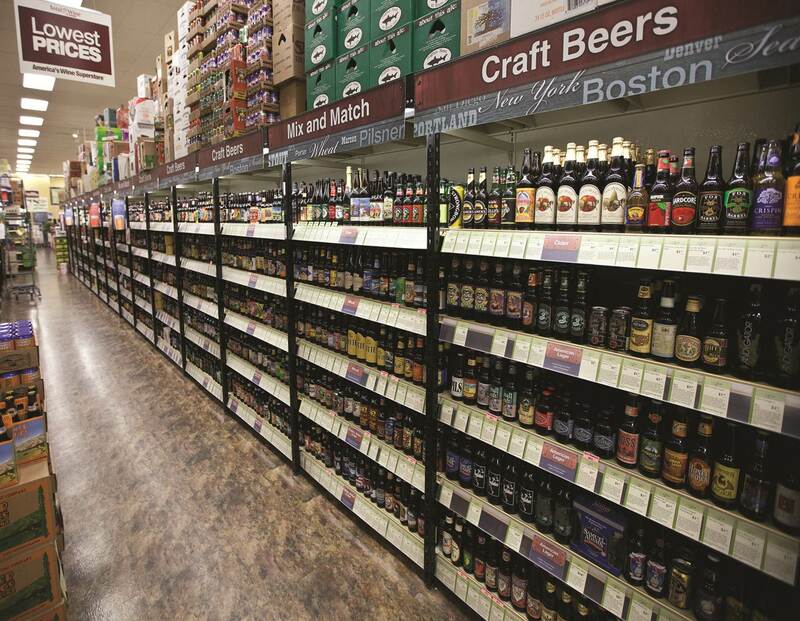 In our beer singles aisle customers are, and we encourage them to be, in experimentation mode. We want them to build a custom 6-pack of different beers of their choosing. And we want them to come back another day and do that again, staying engaged in the world of craft beer, discovering styles and brands. Alternately, the craft 6-pack aisle is convenient for all customers who have a favorite beer/s in mind and are shopping for packs of that/those brand(s). 6-packs are displayed alphabetically-by-brand for this purpose. Total Wine’s store size, vast selection and low pricing collectively offer an environment conducive for customers to spend more time in experimentation mode making beer discoveries. It is a different mindset for most customers while in our stores vs. grocery, club and convenience stores. That’s part of the Total Wine experience. This study of on-premise beer retail seems to corroborate our ’08 pilot findings. We’ve always offered a large selection of beer, however we found that our new beer style grouping of single beers was contributing even more toward encouraging consumers to choose a brand they hadn’t tried before and/or go back to a brand they had not purchased in a while. Some were discovering new beers (styles) from brands they used to drink. Another recent BA article nails the essence of craft beer where it states, “The beauty of American craft beer is the innovation.” Total Wine & More’s craft beer selection echoes the oft-heard craft beer mantra, “No more fizzy yellow beer!” While we do also sell big macro beers, we’d love it if all customers would forego their same old fizzy yellow beer and give craft beer a try. It’s another reason we’ve explored alternatives from the same old fizzy yellow way of beer merchandising. Innovation is also needed at the beer distributor and retail store levels. Brewers and distributors are asking retailers for more shelf space, and we’re giving a LOT more space to craft beer, EXPANDING our craft beer portfolio weekly! With finite space, and offering customers more choices, we must innovate. It is interesting to reflect: Bud/Miller/Coors have long had their industry “beer wars” where winning is by having the most store shelf space for their branded wall of beer. Many believe their primary focus toward consumers has seemingly been on slick packaging, rather than the contents of the packaging. The approach: win consumer hearts and minds (or sophomoric sensibilities) to their brand via TV commercials. 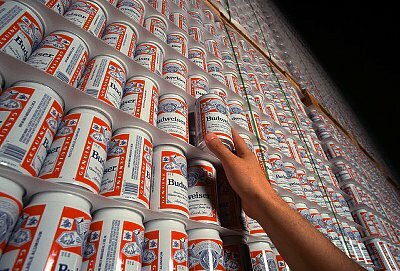 For example, it’s probable that all a “loyal” Bud drinker will do in a store is walk right past the Miller and Coors to get to the wall of Bud. Then, once standing before that wall of Bud, all one can see is Bud, and all one is ever going to buy is — Bud. With only these three major macro beer brands and minor variations in the package contents, this merchandising approach works. You see that brand wall in the store and there’s nothing new in front of your eyes from another brand or style saying, “Check me out. 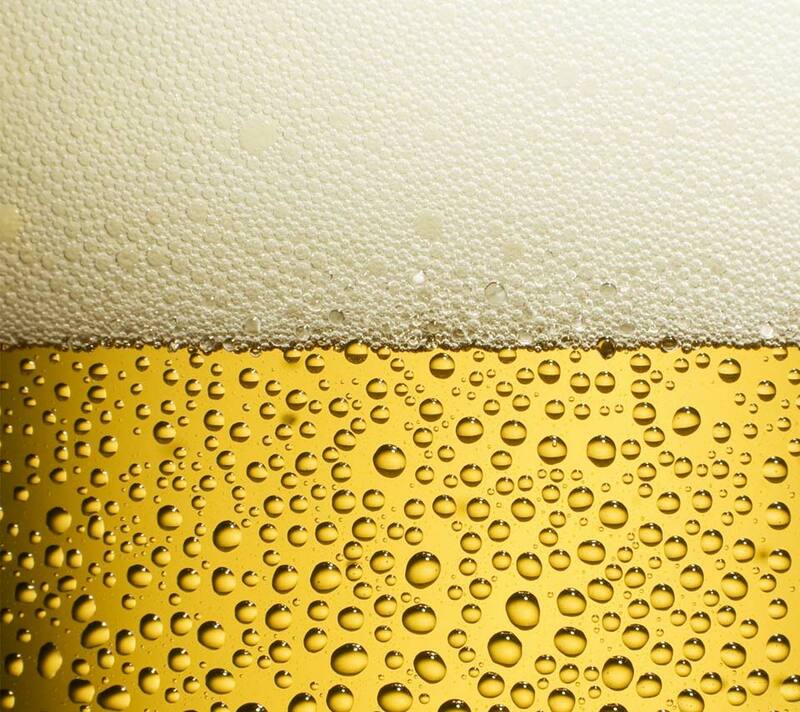 Give me a try.” “I have flavor.” Your world of beer is pretty fizzy and yellow; just the way it’s intended! Is this to YOUR benefit as a consumer? Isn’t this what craft brewers have been fighting against? From our 30 years in the craft beer business we know this is not what craft is about. It’s about breaking out of that mold and EXPERIMENTING and DISCOVERING. It seems craft brewers agree (we’ve heard them say publicly) the craft beer world would be boring if it were only their brand available. They say they want customers to try craft beer even if it isn’t theirs at first, for they are confident that eventually customers will also try theirs. At Total Wine & More we’ve set our stores up to help customers do exactly this. Our display helps to direct the consumer’s focus to the CONTENTS of the bottles and cans where the true differences exist between craft and macro. Attractive, creative packaging is certainly important as is the brewery story, but where packaging and story may get consumers to try the beer once, it is the liquid inside that either will or will not get them to keep that brand in mind (in a positive way) and come back to it. We know this about our beer customers: whether they are beginners or experienced enthusiasts, they can quickly “sniff out” (taste) the quality beers from those that are, well, not so quality. Through all of their experimentation, beer consumers will come back to and land on those craft brands that stand out to them. Brand affinity is built, and they’ll buy 4- & 6-packs of those brands. Check out Part Two of this 3-part series, which discusses Too Many Choices, Women Beer Shoppers, “Wine-ifying” Beer, the Restaurant/Bar and Retail Store Experience, and Beer Education. Ɨ Today Total Wine & More is the largest privately held, independent retailer of wine, beer and spirits in the United States.